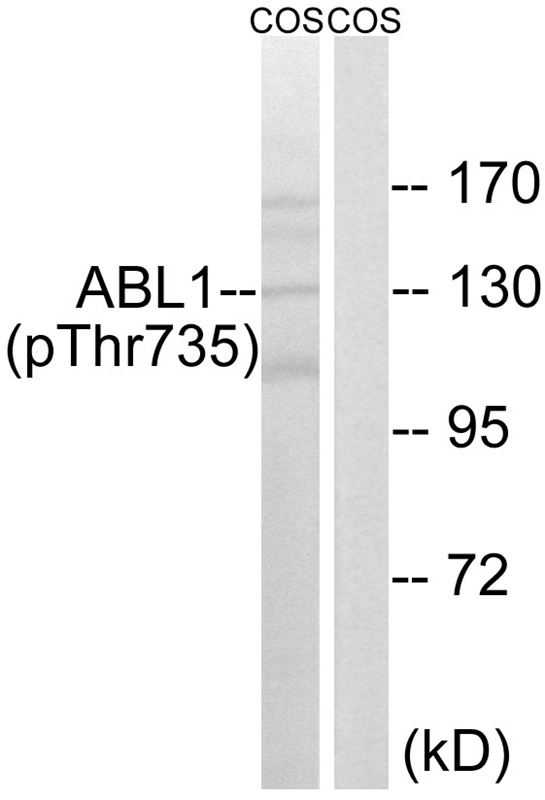 The antibody detects endogenous levels of ABL1 only when phosphorylated at threonine 735. Peptide sequence around phosphorylation site of threonine735 (S-V-T(p)-L-P) derived from Human ABL1. The ABL1 protooncogene encodes a cytoplasmic and nuclear protein tyrosine kinase that has been implicated in processes of cell differentiation, cell division, cell adhesion, and stress response. Activity of c-Abl protein is negatively regulated by its SH3 domain, and deletion of the SH3 domain turns ABL1 into an oncogene. The t(9;22) translocation results in the head-to-tail fusion of the BCR (MIM:151410) and ABL1 genes present in many cases of chronic myelogeneous leukemia. The DNA-binding activity of the ubiquitously expressed ABL1 tyrosine kinase is regulated by CDC2-mediated phosphorylation, suggesting a cell cycle function for ABL1. Fainstein E., Oncogene 4:1477-1481(1989).Shtivelman E., Cell 47:277-284(1986).Chissoe S.L., Genomics 27:67-82(1995). Western blot analysis of extracts from COS cells treated with EGF using ABL1 (Phospho-Thr735) Antibody.The lane on the right is treated with the antigen-specific peptide.